A trade/gift for some dear friends for letting us stay in their mountain home in Northern Colorado at 8300 feet. They hinted that they (and other visitors) wanted to become better at identifying the trees on their property. The vertical slot on the left has a little notebook that contains a key and descriptions of the 5 different trees; Ponderosa and lodgepole pines, quaking aspen, Douglas fir and Englemann spruce. An important aspect of my design was giving my friends the ability to "change out the samples" because the fresh, green needles will turn brown before long. Because of this, I did not want a piece of glass covering the unit. The cabinet is 4" deep and roughly 16x20. I made identical cut-outs in five panels of 3/4" rotary-cut fir plywood then glued them together. Finally, I screwed on a 3/8" thick back using the same plywood. I embedded a keyhole hanger for hanging the piece and finished it with clear lacquer. It was a fun project and I would love to be commissioned to make another someday. What makes our flight paddles unique are the acrylic, shallow cups that we adhere into the bottom of the drilled wood holes. This feature allows us to add a burst of color into the wood board. But, most importantly, allows for easy clean up of the holes or "reservoirs." And like all of our wood products, they are expertly sanded to perfection. In 2010, a local brewery came to us because the reservoirs in their wood beer flight paddles had turned nasty and black due to mold. They asked us to come up with a better alternative to cure their mold problem. At the start, we concluded, based upon our collective woodworking experience, that whenever beer sits in a wood reservoir for an inevitable, extended time, it will break down any wood finish. So, we set out to design a sampler tray in which the beer glass does not sit in a wooden reservoir. We decided to make a couple prototypes in which each had a piece of wood with a hole drilled all the way through it so that residual beer does not collect and sit in a wood hole. Admittedly, we desired to re-design a couple existing product designs that were available on the market. The first prototype was simply a flight paddle with through holes. When on a table, the glasses- they have to be tapered- sit on the table's surface. When one needs to carry the glasses, he or she lifts the paddle and it will hug the tapered glasses about mid-glass. We concluded that this design is inherently non-ergonomic and cannot be improved upon. The second prototype was a four part assembly that had a top piece containing the through holes. The glasses slid through the holes and stood upon the bottom piece. This design provides the most "security" for the glasses, however it is a rather complex design and therefore more expensive. Also, a brewery representative told me that the top piece of wood is a "visual distraction upon the full tasting experience." So, again we concluded that this design could not be improved upon. So, the next day back in 2010, I told the brewery that we cannot make a durable, ergonomic, cost effective flight paddle. I then boldly expressed that they should have their current wood design produced in black acrylic. They were unhappy with me and insisted that they wanted them out of wood and would seek help from another company. On a further note: I visited the brewery six months later and all their flight paddles were made of black acrylic. In the Spring of 2016, New Belgium Brewing, in my hometown of Fort Collins, Colorado, asked us to design and make them 150 flight paddles out of wood. We were their go-to-guys for production woodworking, so I didn't want to give them an immediate "no." And that's when it finally occurred to me; we need to marry the two materials, acrylic and wood! We now have the ability to create any size acrylic cup in just about any color. Plus, we can laser engrave an image into the handle. We recently made a small batch of promotional boxes for New Belgium Brewing's Fat Tire Belgian White beer. Allow me to boldly say, I've never been too impressed with any other "slide lid" box designs. I proposed this design, with the lid shooting out of a slot in the front side of box, to a client years ago but it never came to fruition. I'm happy that we finally got a chance to manufacture "my twist" on the slide lid box because all things considered, I think this design looks and functions best. We recently finished 55 boxes for a local promotional products agency, Brandblox. They supplied these to my alma mater, Colorado State University. They were faculty gifts and a 3" diameter compass was placed in each box. They are made out of Colorado blue stain (beetle-killed) pine. We used a pair of Soss brand solid brass barrel hinges and a Highpoint brand small box catch. I highly recommend both of these products for making wood boxes. Also, we used Donjer brand emerald green flock. We just completed an interesting job. We made cherry wood recipe card boxes for 25 passengers boarding a luxurious, twelve day/nine city, private jet vacation. Some of the cities that they will visit are; Poughkeepsie, NY; Greeley, CO; Rockford, IL and Stockton, CA. Sorry, just kidding. Actually, they're going to Paris, Copenhagen, Seoul, Florence, Tokyo, Chiang Mai, Hong Kong, Mumbai and Lisbon. The passengers dine and learn how to cook in these cities. Then they make notes on 4x6 recipe cards and stick them in the boxes we provide. "On this groundbreaking journey developed in partnership with world-renowned Copenhagen restaurant Noma, track the evolution of food, culture and creativity across Asia and Europe. Curated by René Redzepi and Noma, you’ll enjoy an insider’s look into the people, places, and products that are changing the culinary landscape of our world." Introducing our Craftsman Corbel. Its style compliments many related architectural designs such as; American Craftsman, Mission revival, American Arts and Crafts movement, Prairie School and California revival. Also, due to their simple and unadorned design, our new countertop corbels and shelf brackets are suitable for contemporary interiors. Currently, we offer them in two sizes; Model 8 and Model 10 and two wood types; red oak and paint grade. While visiting the "Arts and crafts movement" wiki page, I found this quote from 1893. It still is pertinent today. Occasionally folks call and ask me to explain why our Paint Grade Straight 8 shelf bracket costs $13, but IKEA has a comparable shelf bracket for a mere $4. bracket are similar. However, here are some differences. Our three bracket parts are 3/4" thick, whereas IKEA's are 5/8", plus our vertical member is 2" thick, whereas IKEA's is 1 1/4". Despite ours being more substantial in size, I think both brackets are more than sufficiently strong. A few years ago I loaded one of our shelf brackets with 500 lbs. and it did not fail. Since IKEA's horizontal member and diagonal brace are let into shallow grooves, I suspect theirs will handle a large load as well. The IKEA bracket is unsanded and only some edges have been crudely eased with a 45 degree champher. I would expect that most buyers would sand them a bit coming from the box. On the contrary, our bracket's edges are expertly rounded over and are perfectly sanded. Occasionally I read that our customers inspect ours with intent to sand them, but they cannot find a single flaw. Lastly, we drill our two screw holes through the vertical member deep enough to accept (included) button head plugs, whereas IKEA does not and you must accept the appearance of screw heads. In conclusion, if you are buying brackets purely for economy and strength, perhaps you should choose IKEA's model due to their very low price. But if you're looking for strength, dependability and perfect fit and finish; you should choose our brackets. Plus our customer service is excellent and they are made in Fort Collins, Colorado. In 2015, we "on paper" designed a new cove-style brace for our line of corbels for countertops and shelves. It is similar to our concave brace design, except it looks "beefier" when viewed from the front. So, we decided to use a "cold" laminating technique and build bending forms to glue and clamp six, 1/8" strips. But, after about two weeks of trial and error, I decided to quit the process because there were too many expensive and time-consuming problems to solve. Next, Steve and I decided it was finally time to spend the necessary time and effort to create a method for flush trimming the parts by sanding. After extensively researching the market for the sanding machine that we had imagined, we concluded that there was nothing available for our task. Steve decided that he could design a custom idler drum for our existing edge sander. He had a machinist build it to his specs and attached a large bearing to the bottom of the drum, allowing us to efficiently flush trim sand our corbel parts. To my knowledge, we are the only manufacturer using this technique. We will gladly discuss the details of this machine if you give us a call. Despite being our most expensive brace option, the cove brace is now our best selling corbel design and my personal favorite. This summer, the kids and I made a few "Pressed Leaf Memory Games." It was a very fun and rewarding art project that incorporated skills that anyone- young or old- can master, including; leaf identifying and collecting, rubber stamp carving, precise paper cutting and hand lettering. Before we started we had to make some decisions regarding the game's appearance and function. We figured that a roughly 3" x 4" playing card would be a nice size and that laminating it would be the best choice for durability. We wanted the card backs to have art on them, but they all had to be nearly identical for fairness of play. We also thought that a set of 24 (twelve pairs) would be a nice amount per set and that the leaves would be most interesting if they were different, thus emphasizing the variability among the species. Honestly, I find it unfortunate that I had to marry the leaf's natural beauty with plastic, but all things considered, it was the best choice. We searched the internet and found laminating pouches that measure 3 1/8" X 4 1/2". They are intended to be used with inexpensive, home laminating machines that are available at many stores for about $30. Since the cards are relatively small we decided to pick "baby leaves" in the Spring. We collected all the leaves during the first half of May 2016. There are few native broad leaved trees in Fort Collins, Colorado, so we mainly collected them from ornamental trees along the city streets and in our parks. We collected leaves from many varieties of trees including; ginkgo, hawthorns, maples, oaks, aspen, cottonwoods, lindens, sweetgum, redbud, hackberry, pears, tuliptree, beeches, birch, alder, and believe it or not- many more. Also, using immature leaves allowed us to press compound leaves such as honeylocust, white ash, walnut, hickory, boxelder, and mountain ash. The leaves were then pressed in one of our wooden Leaf Presses. We used an 80lb. linen paper and cut it 2 3/4" x 4 1/8". Over the past few years, the kids and I have developed an interest in rubber stamp making and we figured that it would be a perfect thing for the back side of our cards. The kids carved an owl, a kitty and a truck. Since I'm giving the set in the picture to my mother, I decided to immortalize her pet chihuahua. We use carving rubber from Blick Art Supply. We only use Speedball's #1 cutter and this handle. First, we stamped 24 of our sized paper backs. Next, we each chose 12 pairs of leaves, and in our best handwriting, wrote the leaf name on the front. Then we carefully placed the leaf on the paper, slipped it into the pouch, then finally through the laminating machine. Note that we did not adhere the leaf to the paper because the lamination process keeps the leaf in place. In case you've forgotten how to play Memory, here are the rules. That's it. We like to keep our sets rubber banded and not "put away" because visitors like to play or simply admire them. Have fun and if you have any questions feel free to contact me. From January to May 2016, we made five projects for New Belgium Brewing. NBB is located two miles away from our shop in Fort Collins, Colorado. We made 150 "apple crates" for four four-packs of 16oz. cans of New Belgium's new offering, Side Trip Cider. The sides and bottom are made of 1/4" thick, rotary cut fir plywood and the inside corners are hickory. The crates were stained gray to resemble old, weathered wood. This package will be for promotional purposes and will not be available in stores. We made 50 Flight Paddles for NBB's "Liquid Center" in Fort Collins and their new brewery in Asheville, North Carolina. We packaged an additional 100 in individual boxes with four mini globe glasses for retail sale at the two locations. They are made of hard, white maple. What makes them unique are the custom made red acrylic cups which allows for easy cleaning. We made 50 arrow-shaped cutting boards as a promotion for NBB's new hard apple cider, "Side Trip Cider." They are made of hard, white maple. We made over 300 lantern/bottle holders out of 1/8" and 1/2" baltic birch plywood for NBB's "Lost In The Woods" parties. The four sides were laser cut. No tools necessary, the front panel is removable and slides down onto the box. When they asked us to make them, I was like "what the heck is a jockey box?" It's basically a cooler with tap handles. It allows beer to be served at events wicked cold. The open-front wood cover doubles as a serving table. Plus, it allows for three laser cut images for signage. They are made of ash and have steel corner details. Get organized! This impeccably crafted cabinet is suitable for an office desktop, craft table, or the kitchen counter- to name a few ideas. It can also be easily hung on a wall with two 1/4" screws (provided) placed through the back and into your wall studs. 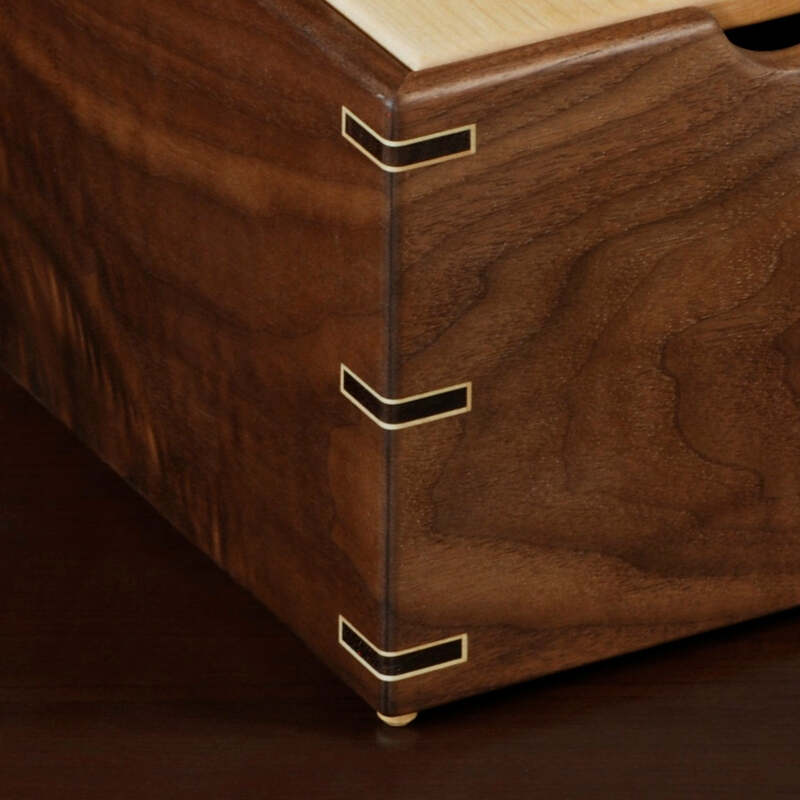 The case and drawer fronts are made of beautiful American black walnut. 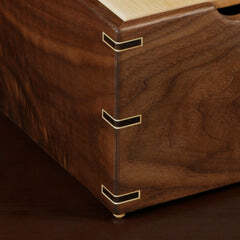 The drawer boxes are made of 1/2" baltic birch plywood and feature an inset blackboard. The metal, ball-bearing drawer slides are "push to open", so you simply press anywhere along the drawer front and the drawer springs out about 4"! The finish is high quality, low sheen, clear lacquer. The case has been plate joined or "biscuited" and screwed. The screw holes are filled with 1/4" diameter Peruvian walnut face grain plugs. The "proud" vertical inside edges have been 30 degree beveled, then charred with a blowtorch. The drawers are constructed similarly to the case plus has grooves in the sides for twelve, 1/8" Baltic birch dividers that are included. The drawer fronts feature an inset blackboard measuring 1 1/4" x 4". You may notice that this is the same "cut-out" as the handle in our serving trays. It measures 15 5/8" tall, 12 1/4" wide, and 14 5/16" deep. The drawer interiors are 9" wide x 11 1/16" deep. The top drawer has an interior height of 2 1/8" and the bottom three are 3". We can also custom make similar cabinets by request. Please feel free to call Tyler at 970-690-0503. First of all, I've come to realize that the "academic" method of collecting, pressing and mounting botanical "specimens" is quite technical, yet fascinating. To describe it briefly, the collecting and pressing aspects are based on rigid, botanical standards; however, mounting the specimens is a combination of technical guidelines and artistic "license." I have attached a link below that describes the proper technique for preserving botanical specimens for museum databases. On the other hand, the techniques Olivia and I employ are very easy. When Olivia and I go out specifically to collect leaves, we bring the press and blotting paper. We carefully choose 2 or 3 perfect leaves from a given tree, place them between the blotting paper sheets then clamp them in the press. If we don't have the press with us, we will place leaves between the pages of a phone book (the only good use for a phone book these days) then transfer the leaves to the press as soon as possible. We empty the press after about one week. But, we typically don't mount the leaves at this point. We store our leaves between the pages of large, hard-covered books. Don't worry because at this stage the dried, flattened leaves will not damage your books. When we're ready, we mount the leaves. We simply place a few dabs of white (Elmer's) or yellow glue on the back of the leaf, then flip it over on your paper. Then, use your fingers to clamp and smooth out your leaf. We then like to write a note or two on the front or the back of the paper. These notes may include the common name, scientific name, shape description, date, location, or something personal; like, "My First Shantung Maple Leaf Found in Fort Collins!" Your recipe card box has been finished with an oil/varnish blend. We have chosen this "penetrating-type" finish as opposed to a "film" finish because it gives the box a more natural appearance and is easy to maintain. We suggest that you apply additional oil to your box about once a year. We recommend Watco Danish Oil, Minwax Antique Oil, or Deft Danish Oil. These brands are found in most hardware stores. First, you may want to give your box a light sanding with 180-220 grit sandpaper to remove scratches or marks. Next, simply wipe on a light coat of oil, and about 5 minutes later, wipe off the excess. You may be wondering, "What if I never oil my recipe box?" Well, it will continue to perform just fine. However, it will look dry and lack the luster that results from additional coats of oil. Please consider the annual oil application a caring gesture. Enjoy. In March 2008, we tested and photographed two of our corbels supporting 500 pounds each when uniformly loaded. The day began with Steve and Loren borrowing five, 100-pound discs from the gym around the corner from our shop in Fort Collins, Colorado. Then we realized that, despite having a 2500 square foot shop, we didn't have any suitable wall space to conduct our experiment. So we built a makeshift wall in the center of our assembly area. We then attached a Maple Concave 10 corbel and a 3/4" X 16" X 16" plywood shelf to our wall with the same hardware we provide our customers. Loren and Steve very carefully loaded the shelf, one 100-pound disc at a time and... success. No broken corbels (or toes!). Next we tested and photographed our Maple Concave 14 and it too performed the task. I'm often asked, "Why don't you sell your corbels to the countertop installers, then they will re-sell them to their customers." Easier said than done. Why? From the information I have gathered over the past 10 years or so, countertop installers simply don't want to deal with corbels and have valid reasons not to want to include them with their service. There are too many styles of corbels to choose from; there is a wide range of simple corbels and an even wider range of ornate styles. Many corbel designs are difficult to install easily. Wood corbels are typically unfinished. When mounting corbels to cabinetry, often the cabinet panels are too thin and require additional carpentry work to mount the corbels properly. 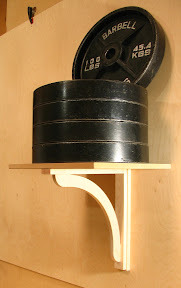 How strong are the corbels? And if they fail and the countertop overhang subsequently fails, who's responsible? Our simple approach is to have the countertop installers trust our product and service and ultimately refer their customers to us. Our corbel/shelf bracket braces (the concave, straight or cove diagonal member) are attached with screws and no glue. If you'd like, you may unscrew these to facilitate the finishing process. Please place a mark (like, a number) on the end grain of the brace and the same mark on the "L" to designate matching parts and it will be easier for you to reassemble them later. Also, the corbel's/shelf bracket's "L" joint is screwed and glued, so don't attempt to disassemble this portion. If you opt to stain your corbels/shelf brackets to match your existing cabinetry, it may be obvious; but, we suggest that you start by ordering the same wood type. If we don't offer the wood type that you need, please give Tyler a call and he can discuss your options. Getting your stain to match perfectly can often be a difficult task, so we suggest you consider finding out what stain was used on your cabinets and hopefully purchasing some from the cabinet manufacturer. If this is not possible, you may want to bring a part of your cabinets (like, a drawer front) down to your local paint store and they may mix up a matching stain for you to purchase. We don't offer all of our corbels in a paint grade, sorry. If your corbel is not offered in paint grade, we suggest you purchase the maple model. Our paint grade models may contain discolorations and/or non-structural, filled knot holes. The brace and mounting plate portion may be maple or poplar. The "L" portion is always maple. Both maple and poplar are "tight, closed grain" woods, ideal for painting. Allow me to share a couple observations that I've made based on talking to customers and seeing pictures of their installed countertops. When customers mount their corbels to a half wall with a painted drywall finish, they tend to consider the corbels an architectural element (like the base molding) and therefore finish them to match their trim. On the contrary, when customers mount their corbels to a paneled island or peninsula, they tend to choose a finish that matches their cabinetry. So, about 10 years ago I started using a wood finishing spray booth on the weekends while Sheldon used it M-F. Going into this arrangement, I was well aware that he was an uptight perfectionist plus super territorial, and I had to comply with his rules. Sheldon is in his mid-forties and is best described as a good ol' boy; which ain't a redneck, you know. Billy Carter once proudly described the difference between a good ol' boy and a redneck: the redneck throws his empty beer bottles out the window of his pickup truck but the good ol' boy tosses them in the back. But, perhaps this isn't the best analogy for Sheldon because he doesn't drink. Anyway, Sheldon deserves credit due to his methods of work. I recognize that these three methods I'm going to describe are specific to the woodworking industry and are extremely mundane, but bear with me. "What a stupid thing to do." That's what I originally thought about Sheldon's precious stir stick that he's used forever. The stir stick gets used only when a new five gallon bucket of clear lacquer is opened, which occurs about every four days. I half-listened to him saying something about wiping off the stir stick with one paper towel (half-used preferably). He then pointed to a screw on the side of his workbench, "and always hang it back here." At first, I was like, whatever. I have been stirring buckets of lacquer for about 10 years prior, and the beautiful thing about working in a woodshop is- there are stir sticks wherever one looks. Just grab a piece of scrap, stir then throw it away. Then I was introduced to his staining board. It's just a 2 foot by 8 foot piece of ¼" thick, white melamine. He places the smooth, non-absorbent board atop his worktable and uses it whenever he stains cabinet doors. I was critical because I had always thought that staining should be done on scrap cardboard. The cardboard soaks up the excess stain and then you just throw it away after each job. On the contrary, Sheldon preaches that if you apply the proper amount of stain, you don't have to be concerned about the excess. At the end of the job, he cleans the board with about an ounce of lacquer thinner then he leans the board against the outside wall of the spray booth. It recently came to my attention that Sheldon hardly ever throws away his ten cent, blue nitrile rubber gloves. "Only after I wear one out and it develops a hole, do I throw it away," he told me. On the other hand, when I would do messy staining jobs, frequent interruptions would cause me to take my rubber gloves off often and I would throw the soiled pair in the garbage and get a new pair when I started back up. Once again, I'm fully aware that these woodworking methods are hugely ho-hum; however, Sheldon's methods deserve credit or more accurately his habits deserve credit. When I asked him if he's an environmentalist he replied, "I don't know. But, I do know that I hate wasting stuff. I suppose I'm just a cheap bas%@#!" "A couple weeks ago we sent a customer the wrong order. He called us up to inform us of our error. He was very reasonable and we promptly sent him the correct order and arranged to have the incorrect package picked up the next day by UPS. So, I just received a note from him. He mentioned that he received the correct (corbels) this time and he loves them, blah, blah, blah. But strangely, he concluded his note, "Thanks for the great service." Great service? We got his order wrong! Maybe great service is merely being a seller who is responsive and competent (50% of the time.)" "In my days as a corporate VP, I often heard myself saying, 'We don't have 100% control over everything that happens in our business. We DO, however, have 100% control over our response.' It's amazing how forgiving a customer will be, if only you take responsibility for mistakes, and go out of your way to make things right. Long story short: I actually had a report run, showing that customers who DID have a problem, and who DID interact with our Customer Service Department, actually placed MORE orders, over the following year, and spent MORE $$ than customers who didn't have a problem that lead them to Customer Service. We'd given them faith that -- if something went wrong -- we'd do what it took to make it right. Seems like a lost philosophy. Good for you for finding it, again." We now have the best selling corbel on Amazon.com! In November 2012 we were commissioned by Justin Larson of Vaught Frye Larson Architects (VFLA.co) to make 22 custom cutting boards. They are made of maple and walnut and measure 13" x 19" x 1". Justin designed them and VFLA gave them as Christmas gifts to their clients. We were very enthusiastic to work on this job because we think that engraved cutting boards are one of the most functional corporate gifts. While riding my bicycle, no-handed, at 7 am on a Saturday in July, I first noticed this tree while looking around at everything but the totally familiar road in front of me. "Cool. A sweetgum. I'll look at it more closely tomorrow," I thought while speeding by. Honestly, I have never seen a sweetgum tree, however I distinctly recall their starfish-shaped leaves from my Dendrology class in college back in 1992. I was positive that it was a sweetgum, and I was happy to know that my first sighting happened right across the street from Library Park, historically my favorite place to spend time with my daughter, Olivia. The next morning at 7 am, I leaned on my bars and braked in front of the tree to take a closer look. "Huh... two-winged samaras?" I thought that two-winged samaras, or helicopters, were exclusively a feature of maples. "Surely, sweetgums must be related to the maples," I convinced myself. So, that night I did some research on sweetgum. I went to Wikipedia's entry about Liquidambar Syraciflua and it states,"The leaves are rich, dark green; smooth, shiny, and star-shaped." The leaves pictured looked almost exactly like the leaves of "my" tree. But... "the fruit is a woody multiple capsule...popularly called a gumball" No two-winged samaras in the sweetgum description...anywhere. Meanwhile, I was keeping a very interested Olivia abreast with my developments. "It's a Mystery Tree," we concurred. For the next couple weeks I spent a few minutes each night doing research on maple leaves and potentially mutant varieties of sweetgum -mainly looking through Google images- with no success. I enlisted the help of my friends who also loved trees- or just loved a good caper. Then, my landscape architect friend, Arthur Fairburn, came by my shop and confidently told me that the Mystery Tree is no longer a mystery. He was sure it was a Trident Maple. Five years ago, Arthur had taken a tour with Fort Collins' city forester and he distinctly recalls the group stopping in Laporte Avenue's median in front of Washington's Bar. The city forester said, "These are three examples of my favorite type of tree in Fort Collins, these are Trident Maples," And he went on and on about it's shade tolerance, it's lack of surface roots, it's beautiful shiny green leaves and other virtues. So, seemingly the mystery had been solved. But, since we had an internet connection close at hand, we did a quick "Fact Check," and right away, we knew that this wasn't the correct ID. One after another, the Google images were showing three-lobed leaves, not five. And then our Latin 101 finally kicked in. "Of course the Trident has three lobes!" Arthur was deflated and felt betrayed by the city's "expert." But strangely, I was relieved. I was enjoying this mystery and I wasn't ready for it to end. In the following days I got calls, texts and emails from my dutiful friends. "It's gotta be a Korean maple," said Andy. Greg said, "definitely a Chinese maple." I would proceed to do a 10 minute Google image check... then I had to return their messages with "nice try." For the next few weeks, I took a look at the Mystery Tree every morning. I think it reinforced my desire to ride my bicycle daily; surely, I wouldn't drive to it and then pull over and then park the car and then get out and then walk up to it. Then, one late August morning, Andy told me that he was having lunch with theTom Throgmorton. Tom has had a plant advice radio show on KUNC for 20 years. Andy excitedly told me that Tom agreed to take a look at the tree and identify it after their lunch. I said, "Cool. Thanks." But, my instincts told me that if today was the last Mystery Tree day, I was going to be the one to ID it. So, I dropped what I was doing and did some more internet based research in earnest. The funny thing is; this time, under pressure, I solved the mystery in 10 minutes! Turns out it's a Shantung maple (Acer truncatum) and it's native to Northern China. I told Olivia and asked her if she could help me remember the name Shantung. She agreed and asked, "are there more in Fort Collins?" The calendar flipped to September and I was feeling anxious to investigate other Shantung maples and get a look at other unusual deciduous trees before the leaves started to turn. I recalled hearing years ago that our City Park had a "Self Guided Tree Tour." I called their office and they told me that they have a complementary, 5-page handout consisting of a map and list of 220 trees. It was a gorgeous fall day and I cut out of work a bit early and went to the park to get my pamphlet. I skimmed through the list of trees and to my surprise, saw "Shantung maple C119" on the list! I quickly found it and at a glance it confirmed my identification of the other. When I returned home, I told Olivia that I found Shampoo maple #2. "Awesome. But it's called Shantung, Daddy." The next day, out of curiosity, I went to check out the three Trident Maples in Old Town that Arthur told me about. Instead, I was shocked to see a trio of Shantung maples! So, Arthur's memory was correct! But, the city forester's ID was wrong, but I can forgive him. So, just 6 blocks from my house...#3, #4, and #5. At some point during the summer, I made a parallel between my Shantungs and Steve's asparagus. So Steve, whom I've worked with for 14 years, would spend some time each day after work to find wild asparagus. All casual observers, including myself, would ask him the same question, "Why do you waste your time looking for asparagus when you could just go to the store and buy a bunch?" Steve would reply, "It's the search that I enjoy." I can relate. Furthermore, I think Steve's simple philosophy should be practiced more often these days by children. Obviously, our lives are crowded with stuff that will help us achieve instant gratification. For example, there's a possibility that the City of Fort Collins has published a map depicting all the trees in our city, potentially showing us where each Shantung maple is located. However, Olivia and I are opting to locate them ourselves and create our own map. And who knows? We could possibly develop other passions, like bird watching or identifying insects. I think it would be cool if we could find Shantung #6 and then Olivia notices a Praying Mantis on one of it's branches and then a Western Tanager flies by and lands on another branch. The autumn was sunny and warm and clung on- as did the leaves on the deciduous trees- so, with every opportunity, I would frantically seek Shantung #6. And while bicycle commuting, I would crane my neck searching. This dangerous practice almost caused me to smash into a pretty college girl; seemingly, the same pretty college girl that caused me to rubberneck and crash my bike into a parked car twenty years earlier. On a side note, I no longer gawk at the pretty college girls since I have taken Jerry Seinfeld's advice, "It's like looking at the sun. You don't stare at it! You get a sense of it. Then look away!" Unfortunately, Olivia and I never did find another Shantung in 2012. It's now winter and the list remains at five. Perhaps another Mystery Tree will burst buds in the spring? We hope so. If you are not content with the locations of your wood or steel studs in an existing wall, you may install a "backer board." 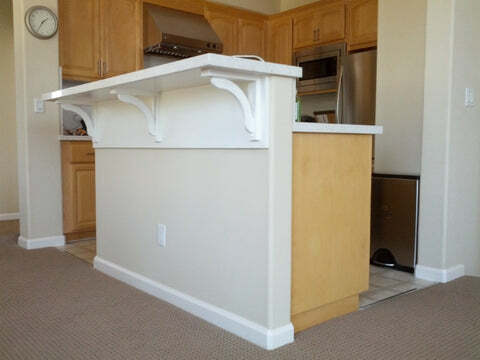 This customer-submitted photo depicts a 3/4" x 11" backer board under his countertop. 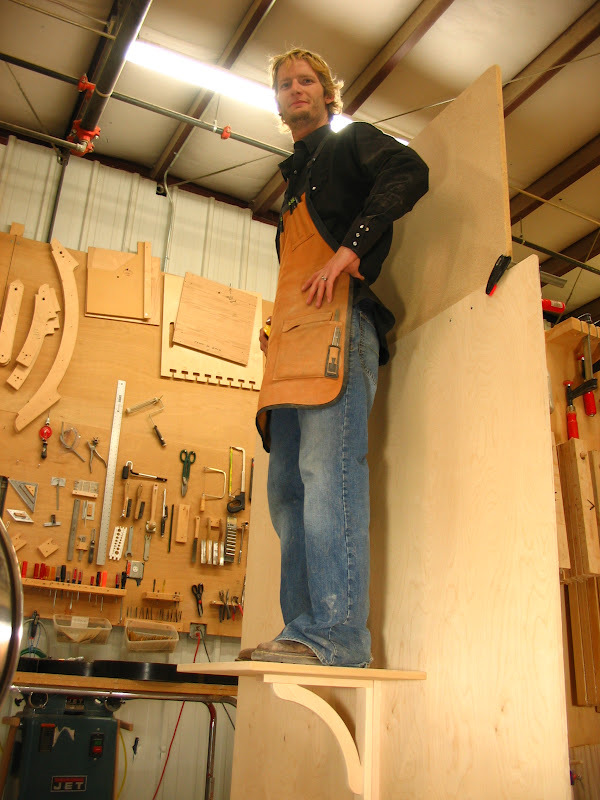 The backer board gave him the flexibility to attach his corbels wherever he desires. He gave the board's edges the same profile (1/8" radius) as the edges of his Maple Concave 10 Corbels. Building Boxes with "Continuous Grain"
Making a wood box with continuous grain shows that the maker selected the box parts with care and pride. In this case, "continuous grain" means that the box sides consist of one board and the parts are assembled in order -allowing the grain pattern to wrap around the corners. 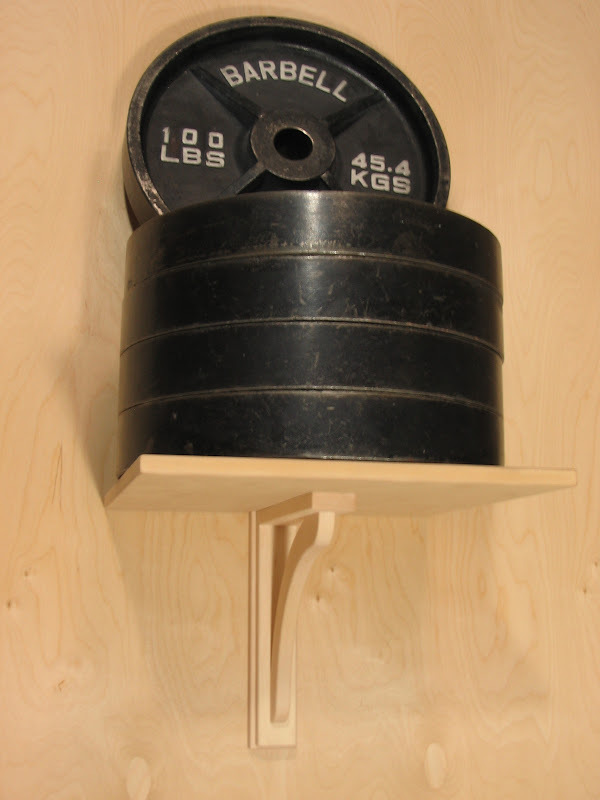 At Tyler Morris Woodworking, we have created a very simple jig for organizing this task and we feel that it’s worthy of note. "Whew. I'm so glad I found your corbels." This is a great way to utilize "shorts," meaning, the board ends that don't go into a primary project. The tray measures 1 3/8" x 6 3/4" x 10 3/4". The bottoms and sides of the "reservoirs" have been intentionally randomly carved for texture. This is the first carved out tray and I intend to make more. This is a gift for my daughter, Olivia. She had fun collecting a variety of oak acorns, as well as the nuts from a buckeye tree. Completed two custom oak brackets today. The customer wants to place an 1 1/2" dowel atop the mounted brackets, then drape a flag over the dowel. I suppose this design will work well for quilts too. The flag/ quilt brackets measure 2" wide x 10" tall x 8" deep. Customers often ask us how our logo is engraved on the bottom of our wood recipe boxes and serving trays. The answer is, we use an electric branding iron. We had the custom branding iron made in 1998 by a company called Brand New. We keep it mounted in an old drill press. The drill press has a broken motor, however, that's just fine. We don't want the drill press to drill - just press. We burn our logo into the bottom parts of our trays and boxes before final assembly. This process allows the logo to look crisp and align nicely. A local, custom job. The headboard and side tables are made of solid walnut. For more info and pictures, please see this Facebook post. 4pm Sunday, June 10, 2012. Hardly a cloud in the sky. The light shining through the shop's skylights is an eerie, glowing orange color. This is Day 2 of the largest fire in our county's history. View to the West from the shop. Feeling sorry for all the folks and animals affected. We recently completed 20 Cutlery Display Cabinets for Zwilling J.A. Henckels. J.A Henckels is a knife manufacturer based in Solingen, Germany. They are one of the largest and oldest (since 1731!) manufacturers of kitchen knives, scissors, cookware and flatware. You may be wondering, "Why is a small, 4-person shop in Colorado making display cabinets for a famous brand from Germany?" Well, here's the story. In 1999, The Cupboard, our local kitchen specialty store, asked us to make a display cabinet larger than the ones Henckels were providing. They desired the cabinet to display knives on magnetic knife bars and knife block sets, plus provide storage for back stock. After a few meetings and sketches, we designed the current cabinet. Then, shortly after we installed three of these cabinets in The Cupboard, the regional Henckels sales representative noticed a spike in sales and notified their headquarters in New York. They then took a chance with us and we have maintained a great relationship since. The original version was made from Baltic Birch plywood and had a clear, lacquer finish. The second version featured "Studio Teak," a laminate with a walnut appearance. Lastly, the third and current version is made from "Leave Likatre" laminate. Interestingly, in 1731 Peter Henckels registered the "Zwilling" (German for "Twin") logo with the Cutlers’ Guild of Solingen. This makes Zwilling one of the oldest trademarks in the world. Loft bed for Olivia, Tyler's daughter. It's made of sixty 8' dry, hem-fir 2x4's finished to 1¼" thick. The posts are 3" wide , the rails are 6" wide, and the stair members are all 9" wide. The rails are joined to the posts with 18 custom made angle brackets. The loft bed has been finished with milk paint plus 3 coats satin lacquer. The stairs were Olivia's idea from the start. Who wants to climb down a ladder in the middle of the night? For more info and pictures about Olivia's loft bed, please see this Facebook post.